Getting a new kitchen or renovating your current kitchen is exciting. The possibilities are endless – but that also means you’ll have many choices and decisions to make. 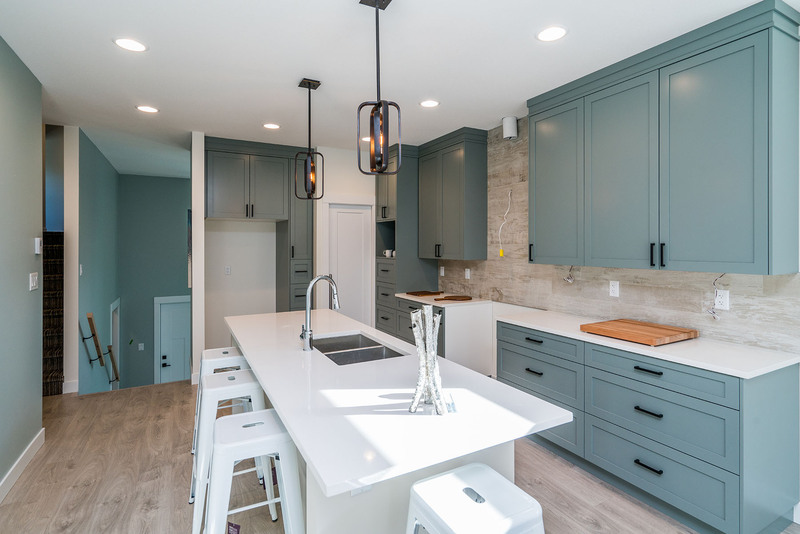 Try checking out these three major current kitchen trends to help narrow down some of the options and get your creative juices flowing. Sleek, smooth, minimalist—that would be the slab cabinet door. Also known as “Euro-style cabinets,” the door is flat with no frame or panel for a clean, uncluttered part of your overall kitchen design. There is a slab door for every budget. Top-of-the-line doors are made from solid hardwood—rich, durable, back-to-nature. For more mid-range doors, furniture-grade plywood, usually pine or another soft wood, is faced with a layer of high-quality hardwood. Particle board (or medium-density fiberboard), for a more modest budget, is used as a core for a door made primarily of plastic laminates or if you are planning on painting the doors. It’s time to free your inner artist. There’s no rule that says all kitchen cabinets have to be one colour – and that’s what sparked this trend. We’ve seen home owners use this current kitchen trend in a variety of ways and you can view the results by browsing through photos in our inspiration gallery. In general, the trend involves choosing a dark colour or wood for your bottom cabinets, with a light colour or wood for your upper cabinets. This has a grounding affect and makes the kitchen look larger, since the lighter shade draws the eye upwards. Another option is to have all your cabinets one colour except for the cabinets on your island. You can choose a bold colour or wood to make the island especially striking in appearance. Get ready for the gasps of admiration, both for the look and for your ingenuity! Move over, granite. Quartz is now king! Thanks to advanced technology, quartz has edged out both granite and laminate for the most popular countertop material for several years running. It’s as beautiful as marble, but more durable. It’s as breathtaking as granite, but requires no maintenance. Because it is a non-porous material, you don’t have to worry about stains, germs, mold, or mildew settling in. Even better, quartz is nearly impervious to chips, dents, and other surface damage. Because quartz countertops are engineered from ground quartz with added resin and pigments, it can be purchased in nearly any colour. This makes it easy to match with your colour scheme, whether you’re doing two-tone cabinetry or not. Quartz can also be engineered into various shapes. Rounded edges and fully-wrapped eat-in counters are a distinct possibility. This current kitchen trend has become more popular each year with no end in sight.